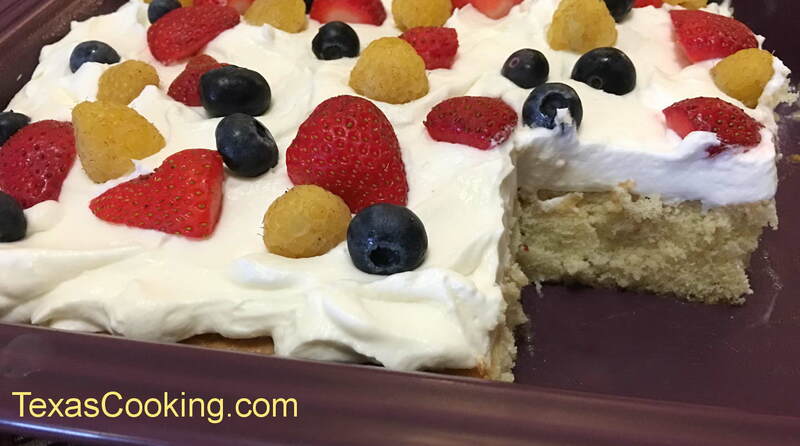 Tres Leches cake is so unique and delicious, it has reached almost mythical proportions. Make it and you'll know why. This is one of Dorothy Sibole's excellent recipes. Grease and flour a 9x13-inch baking pan. Cream the butter and 1 cup of the sugar together until fluffy. Add the eggs and 1/2 teaspoon of the vanilla. Add the flour mixture to the butter mixture, 2 tablespoons at a time, mixing well until blended. When cake has finished baking, pierce it in 15 or more places with a fork or skewer, and let it cool. Combine the whole milk, evaporated milk, condensed milk and liqueur and pour over the top of the cooled cake. When ready to serve, combine the whipping cream and the remaining 1 teaspoon of vanilla and 1 cup of sugar, whipping until thick. Note: Because of the milk in the cake, it is very important that you keep the cake refrigerated until ready to serve. Serve chilled. Caribbean Version: Replace the sweetened condensed milk with 1 cup of Coco Lopez Cream of Coconut in the milk mixture. You can also add 1/4 cup rum.